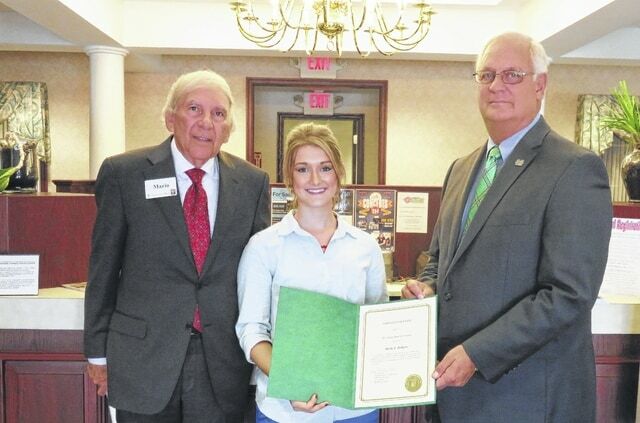 POINT PLEASANT, W.Va. — Mario Liberatore, president of Ohio Valley Bank-West Virginia, on Tuesday presented the first-ever Ohio Valley Bank Scholarship for the Marshall University Mid-Ohio Valley Center in Point Pleasant. Sophomore nursing student Shelby Rodgers received $1,500 in scholarship funds from the bank. The fund for the Ohio Valley Bank Scholarship was established in 2013, with its first beneficiary being named this year. The scholarship for full-time students who have passed their freshman year requires a minimum of a 2.5 grade point average, with priority given to students in Mason County, W.Va., followed by Gallia and Meigs counties in Ohio. Ohio Valley Bank, established in 1872, operates 14 offices throughout western West Virginia and southern Ohio. The bank is a subsidiary of Ohio Valley Banc Corp., whose stock is publicly traded on the NASDAQ Global Market under the symbol OVBC. For more information, visit the Ohio Valley Bank website at www.ovbc.com or on Facebook at www.facebook.com/OhioValleyBank.